Superb clarity of print. Litho print means you can include all kinds of graphics, even photographs, knowing they will print with unbeatable clarity every time. Any size possible. Our minimum label size is 40mm by 40mm, up to A4 sheets. We can also produce custom-shaped labels to your exact specification using a cutting forme specially made for your job (subject to extra cost). Easy to use. 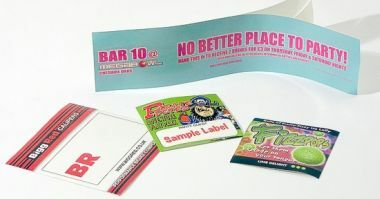 Labels are supplied individually with Crackback paper to make them easy to peel from their backings. Permanent adhesive gives a reliable fix to most surfaces (please note our labels are not waterproof). CD and DVD labels. Perfectly sized CD/DVD labels which can be applied using a standard 'stomper' device, available from good office suppliers and computer stores. Labels are despatched within 8 days. Labels are standard rated for VAT.